Powers/Abilities: Though he possessed no super human powers, Slade was a strong henchmen who frequently used guns and violence on others. (Daredevil I#3 (fb) - BTS) - Slade lived on the streets of New York and had a couple of kids. (Daredevil I#1 (fb) - BTS) - The Fixer was a criminal who booked and arranged fights, often cashing in on gambling debts and commanding henchmen who served his every whim. Slade served as Fixer's enforcer and bodyguard. Years ago, the Fixer offered a local boxer, Battlin' Jack Murdock, a deal, but Murdock turned him down. (Daredevil I#1 (fb)) - Ten years later, Murdock finally agreed to the Fixer's deal. Fixer promised to arrange fights for Murdock if he signed the contract. (Daredevil I#164 (fb)) - While Slade watched, Fixer dropped Murdock's contract on the ground, forcing Jack to sign it while Fixer was standing on it. 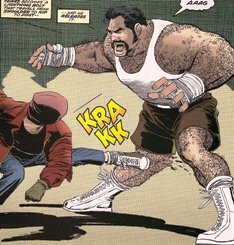 (Daredevil: The Man Without Fear#1) - While Fixer watched, Slade beat up Murdock at Capuzzo's gym, trying to teach him who was in charge. He ordered Murdock to act as his collector, beating up others for unpaid protection money, and threatened to kill Murdock's kid Matt if Murdock didn't comply. (Daredevil I#1 (fb)/Daredevil: The Man Without Fear#1/Daredevil: Battlin' Jack Murdock#4/Daredevil I#235) - Slade was ordered to kill Battlin' Jack Murdock for throwing a fight. 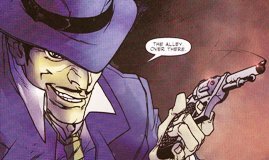 Slade approached Murdock in an alley, where he and Fixer's other men beat him into a bloody pulp before Slade shot him in the head, leaving behind shells of pistachio nuts, which Slade was well known for eating. (Daredevil: The Man Without Fear#2) - The other men in the attack were McHale, Gillian, Marcello, and Angelo. (Daredevil Yellow#1) - Fixer and Slade were implicated in the murder and arrested. They hired an expensive lawyer to defend them. He quickly got them acquitted without bail. On his way out of the courthouse, Fixer told Murdock's blind son, Matt, to never step in the ring unless he knew he could win. (Daredevil Yellow#1 - BTS) - Fixer and Slade went back into business for the following months. (Daredevil I#1/Daredevil Yellow#2) - Fixer and Slade returned to Fogwell's Gym, where they found costumed hero Daredevil with other henchmen, including Porky and Sam. Fixer demanded Daredevil explain himself, and Daredevil claimed to know about Fixer's murder of Murdock. Though Slade and Fixer initially fired on Daredevil, Daredevil managed to disarm Slade and another thug, impressing the Fixer with his skills. Slade stepped in to handle Daredevil, but Fixer ordered him to wait. Fixer then instructed Sam to call the police, but Daredevil knocked the phone out of Sam's hand. Fixer denied Murdock's murder and claimed he had an alibi. When Daredevil advanced on Fixer, Slade shoved Daredevil out the window while he confessed to the murder, but Daredevil shocked them all by jumping right back in. Daredevil ordered all but Slade and Fixer to leave and Porky and Sam gladly ran out. Daredevil revealed that he'd recorded Slade's confession. Fixer pulled the rug out from under Daredevil, then he and Slade ran for it. (Daredevil I#164 (fb)) - While Fixer ran for it, Daredevil knocked Slade down and chased after Fixer. (Daredevil I#1) - Slade reunited with Fixer and they mixed in with a crowd, then ducked into a subway, passing a blind man on their way (Daredevil in his secret identity as Matt Murdock, Jack Murdock's son). Daredevil followed them and the villains split up. Daredevil tripped Slade with his billy club, then chased Fixer down, dodging a trash can Fixer threw at him. Fixer then fell dead with a heart attack. Daredevil then apprehended Slade on the subway, convincing Slade to confess to the murder in front of the transit police by telling Slade that Fixer had confessed everything. (Daredevil: The Man Without Fear#2) - Daredevil also took down McHale, Gillian, Marcello, and Angelo. (Daredevil I#1 - BTS) - Slade later asked the law firm of Franklin "Foggy" Nelson and Matt Murdock for representation, but they denied it. (Daredevil Yellow#3 (fb) - BTS) - A new district attorney wanting to crack down on crime got Slade the death penalty. (Daredevil Yellow#3) - Slade was visited by Matt Murdock, the son of Jack. He refused to apologize for the murder, saying that Murdock deserved it. Murdock wanted Slade to reveal who had been behind the Fixer, but Slade refused to tell him because he didn't want his kids harmed. 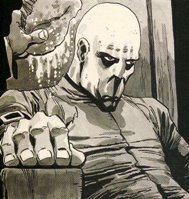 (Daredevil Yellow#4) - Slade was executed in the electric chair and Matt Murdock and others watched. Different artists have had different portrayals of Slade over the years, the most vastly different being in the Man Without Fear series. The bald picture of him on the electric chair could be explained by his time in prison. The different portrayals are pictured below. Per Degaton: Daredevil I#235 has a panel actually showing Slade shooting Jack Murdock, which does not seem to have been seen before.